Description: Clip art photograph of French, British, German and U.S. paratroopers parachuting over Ste.-Mere-Eglise, France. 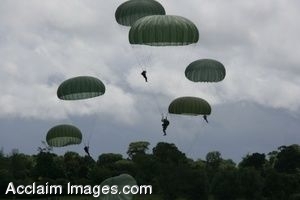 The paratroopers are jumping in honor of the 65th anniversary of the D-Day invasion of Normandy. Ste.-Mere-Eglise is the area most known as the first French town liberated by Allied forces during World War II. (DoD photo by Alfredo Barraza Jr., U.S. Army). Clipart photograph by Department of Defense Public Domain.